Top seed at this week’s Friday Blitz was incredibly strong as Alex Reis returned along with his friend NM Ben Gershenov who was visiting the club for the first time. Gershenov edged out NM Ian Harris for the top seed. As fate would have it, the two masters faced off in the first round. In the first game Gershenov held a strong advantage for most of the game. 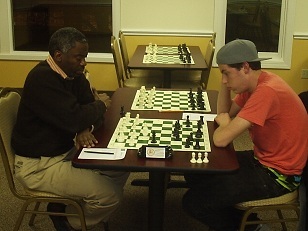 Harris put up strong resistance and was able to reach a theoretically drawn endgame, but with only a few seconds remaining on his clock. The first game went to Gershenov. The second game was the opposite as it was Harris who got an early advantage and then never let go. The match was level at 1-1. The remaining games were fierce as experts Oswaldo Fernandez and Alex Eydelman, as well as Club Director Melvin Patrick and Alex Reis were eager to have their say. Indeed, there were many tough battles to come with both Harris and Gershenov getting upset multiple times. Patrick nicked Gershenov for a draw in round 4. Perhaps the most impressive result was by Reis who defeated Harris in an extremely unbalanced game and who also managed to draw with Gershenov in the final round. Harris also gave up a half point to Fernandez which gave Gershenov the overall win by the narrowest of margins!